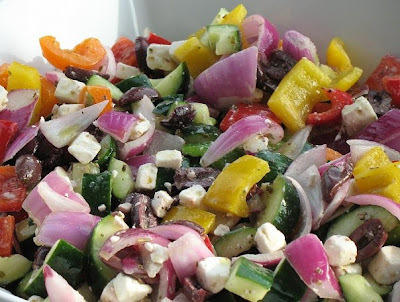 This salad is not only packed with delicious Greek flavor, but lots of color too. It's delicious with grilled fare and we especially liked how it paired up with wild game sausage! Pulse vinegar, oregano and garlic in a blender to combine. With the machine running, gradually add oil through the top vent. Combine bell pepper, cucumbers, onion, feta and olives in a medium bowl. Add dressing and mix well. Season with salt and pepper. Cover and refrigerate until chilled, about 1 hour. JoElen, I am drooling right now. That salad looks amazing!